Editor's note: This article is the "Introduction" to Ron Cherubini's "Way-Too-Early" series that looks at the possibilities for East Carolina's 2011 football season. Other articles in the series are linked below. Coach Ruffin McNeill looks forward to year two at ECU. With the 2010 campaign in the books and National Signing Day 2011 behind us, East Carolina football fans are gearing up for spring camp starting on Monday. The ECU coaches have been full sail working since the day after the debacle in D.C. and have the program clearly focused forward, not behind. While opinions vary as to whether or not the Pirates' 2010 season was a success or a failure relative to the conditions under which first-year head coach Ruffin McNeill came to take the helm, most Pirate fans are eager to look ahead rather than dwelling on the Military Bowl and the less-than-stellar finish to what started as a big-time campaign. With that in mind, it's time for the annual way-too-early preview of the 2011 Pirates, taking a hard look at the ECU offense and defensive personnel heading into spring and on the way to next season. This preview, it should be noted, is based on the current roster, current thinking, and current inputs from the current coaching staff. It takes into account any and all “facts” as presently known, such as positions, player eligibility, player additions and departures, etc. In other words, circumstances can change and you can probably find an error or three if you look hard enough. Coach McNeill took the time to talk with me and share some thoughts about next season, the coaching staff and players, to the extent he could. Starting with the coaching staff, McNeill said he clearly understands the concern out in Pirate Nation about the defense. That said, he believes he has the coaching firepower on defense to right the ship and do it quickly. McNeill also shared his thoughts on his assistants and his mindset on coaching movement in college football. Ruff said he is confident in defensive coordinator Brian Mitchell’s ability to build the type of defense needed at ECU. McNeill said that improvement in the front seven would come through finally having the defensive linemen healthy, getting expected play from experienced linebackers, and the provision to Coach Mitchell of high-quality, game-ready junior college players to step in and add starting power or depth in the front seven. The latter he delivered in spades with the addition of four standout JUCO players (2 DEs, a DT, and an MLB). McNeill prominently demonstrated his commitment to fix the defense with the signing of 14 total defensive players in his first real recruiting class at ECU, noting high school players are the way he plans to build the program. McNeill pointed out that the defense would benefit from getting guys like Michael Brooks, Justin Dixon, Marke Powell and Matt Thompson, to name a few, fully healthy to combine with the JUCOs and the younger players who now have a season’s worth or repetitions under their belts. It was obvious from the amount he expounded on the defense that Coach Ruff has been waking every morning with defense on his mind. So, it took some coaxing to get the conversation onto the offense. On the offensive side, McNeill feigned that he was on the verge of tears when asked about heading into 2011 without Dwayne Harris. “I’d like to find a way to get more eligibility for Dwayne,” he said. “That young man not only was special on the football field, but he also was special off the field, in the classroom, around his teammates… special. Now, we still have a lot of talent at wide receiver, though, and I feel good about the players we have coming back. They may not be Dwayne but they are solid, very solid. Lance (Lewis), (Michael) Bowman, (Andrew) Bodenheimer… they are back and we know what they can do already. McNeill said that the quarterback position is fantastically healthy and that he expects not just Dominique Davis to enter camp way ahead of where he finished last season, but he also expects his other quarterbacks to be carrying a starter’s mindset heading into the spring depth chart battles. The inference is clear that even Davis must earn his spot. “Dominique is the type of kid who is constantly working on getting better and improving on what he did well or didn’t do well,” said McNeill. “He will be healthy for spring and working on those things he needs to improve on. McNeill noted that offensively the staff is hoping to bring in an experienced running back who can step into the battle right away, though he insisted it was no slight to the stable of young, untested backs on roster. And on the offensive line, McNeill believes that despite losing three veteran starters, the players are in place to see a solid if not stronger offensive line in 2011. McNeill said he is very eager to see how the team reacts during the off-season to the demands placed on the whole team in the newly opened Camp Connors — in reference to the re-hiring of one of the country’s top strength and conditioning gurus in Jeff Connors. 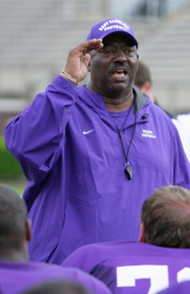 In general, Coach McNeill is simply ready to get to spring practice. I asked Coach McNeill about some of the player rumors floating around this off-season and he gave some details. The program supported the application of a pair of petitions for 6th year medical hardship status for two seniors on the roster in guard/center Doug Polochak and CB Dekota Marshall. The fact that Marshall’s application was denied was a disappointment but not entirely a surprise. “Dekota’s case is more borderline technically,” he said, noting that he felt the case met the spirit of the guidelines. The staff will be watching Marshall’s appeal closely, but preparing to go forward without the talented corner. And McNeill had anticipated that Polochak would be granted his petition. “Doug’s case is pretty much text book. He lost two full seasons with that injury," said McNeill. There has been speculation about several players leaving or returning to the team. McNeill referenced several of them. “Darryl Freeney… if Darryl is willing to make some life changes and team sacrifices then we are willing to discuss him returning to the team," said McNeill. "It’s going to take some intense conferences with me and the coaching staff. “Darryl is a young man that comes from a tremendous, tremendous family. That young man’s mother and father are great people. He has no excuses. Football is not a problem for Darryl… he is a tremendous player, but football is and should be his third or fourth concern right now, frankly. For me, what a young man does off the field and how he carries himself in regards to accountability and dependability make all the difference and Darryl needs to become accountable for his actions. Several inside sources, including Freeney himself, have confirmed that the star wide receiver is back on the team — conditionally — but as of press time for this article, the closest form of official acknowledgement that he was actually back on the team was Coach Riley stating that Freeney had done what was asked of him to this point, but that a lot had to be done to continue on his path back, most of which only time can provide. If Freeney is, indeed, back and walking a straight line toward full reinstatement, this is a huge development as he would have an immense impact on ECU's high-flying offense and would be one of the gems in a receiving corps that could rival any in the country. When center Will Towery abruptly left the program for family/personal reasons, the rumors were that he would be back at some point, perhaps. But it doesn’t look like it. On fellow center Dalton Faulds, he will be back, but has a lot of work to do to regain trust within the program. The stretch rumor that has been going around is that former promising defensive lineman Allen Crowder was looking to return. No truth at all to that one, at least as far as the coaching staff knows. Other comings and goings include former quarterback and current wide receiver Josh Jordan transferring out of the program to play at McNeese State and inside receiver Michael Byrd transferring to another in-state school to complete his eligibility. Byrd, who graduated in December, transferred to begin a graduate program. More than anything, McNeill underscored the point that the players in the program are dedicated to improving on the positives and addressing the negatives from last season. Perhaps that will mean at least similar production for the offense and an improved defense, though to what extent is the big question. With another fierce schedule, perhaps the biggest question is, will an improved defense yield enough to move back to 8-9 wins and another run at a Conference USA title? So, with that, we'll take a look in Part Two on Thursday at what we might expect for next season in the annual Way-Too-Early Look at the 2011 Pirates.